The Federal Emergency Management Agency outlined the need for citizens acting as first responders in its 2018-2022 Strategic Plan, conveying to citizens that a culture of preparedness begins with members of the community. Agency administrator Brock Long encourages people to create community disaster plans in their neighborhoods, know how to shut off their home’s water and gas valves and take CPR training. Tribal Chairman John “Rocky” Barrett assigned Citizen Potawatomi Nation Safety Department Director Judy Rodriguez the task of providing CPR training for the Tribe’s nearly 2,500 employees. Citizen Potawatomi Nation Safety Department Director Judy Rodriguez teaches Tribal employees proper CPR techniques and automated external defibrillator processes. Barrett and Rodriguez discussed the training’s importance during one of their first meetings after she accepted her position in October 2017. He told Rodriguez he was in charge of safety and CPR training decades ago when he worked in the oilfields. Barrett gives it the same weight as FEMA. The Safety Department also manages the burglary and fire alarm testing, food handling inspections and Occupational Safety and Health Administration compliance. They also monitor and resupply the Tribe’s first aid cabinets and fire extinguishers, and lead bloodborne pathogens training. CPN employees began receiving CPR and automated external defibrillator training from the Safety Department a year ago this month. Nearly 1,200 have completed the training, including every member of the electrical, rural water, housing, purchasing and education departments as well as the Office of Environmental Health. The classes mixed employees from various enterprises and departments across the Tribe, so workflow and productivity remained normal. A maximum of four instructors from the Safety Department held classes at any one time. They made learning the techniques of the lifesaving process easy to remember: the correct rhythm for chest compressions matches the Bee Gee’s hit song Stayin’ Alive. Rodriguez took a CPR class about two decades ago and used the technique on her mother 10 years later. The training meant a great deal to her following the incident. Once classes began in late December 2017, word spread around the Tribe’s offices. The Safety Department prepared for the program as quickly as possible; however, some employees wanted immediate training. They requested their spot on the waiting list and volunteered to attend training first. As classes became more regular, the number of certified employees crept into the hundreds. Several employees told Rodriguez they used their training afterward and felt more confident in their ability to help as opposed to being a bystander. Rachelle Sheppard is a nail technician and esthetician at the Grand Casino Hotel & Resort’s spa. 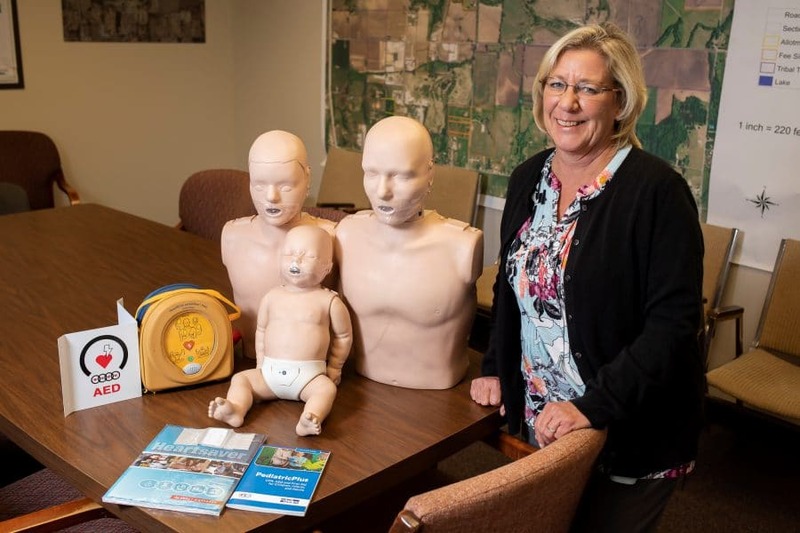 She took the CPR class from the Safety Department in May 2018 and used her knowledge approximately two weeks later during a stressful situation. While Sheppard took cover in a storm shelter during a tornado, a crying woman ran in and said her unconscious sister stopped breathing outside. Sheppard’s husband used his training as a firefighter and began CPR but needed her help to find the AED. “I don’t know that I would have known what I was looking for if I didn’t have that class. So, another guy and I ran in and grabbed it off the wall and took it to him,” Sheppard said. The woman began breathing again before the paramedics arrived thanks to their swift teamwork. Sheppard now calls the training “a necessity” and “a wonderful addition” to her skillset. “I feel blessed to be part of the nation that includes us in things that can be life-changing for people,” she said. Attendees also found comfort reflecting on past CPR attempts while learning the proper technique. The Citizen Potawatomi Nation Health Services’ two clinics are taking over both first aid and CPR/AED training this month across the Tribe. Rodriguez says the Chairman’s goal of training everyone remains the same.